As we age, our bodies go through a number of changes that make it difficult for us to get around as easily as we once could. We may move slower because of chronic back pain, aching joints, or weakened muscles. Seniors may also become less mobile as a result of bone diseases such as osteoporosis. Bone diseases in the elderly are particularly painful and can even be life-threatening. As family members or caregivers, what can you do to help care for seniors with bone disease? And how might a homecare system or homecare software aid you in this endeavor? Our bone density decreases as we grow older. This can lead to fractures, bone cancer, or other bone diseases. For seniors who live at home with the help of a homecare system or homecare software like ClearCare Online, caregivers can easily refer to their client’s assessment for details on managing or treating their disease. Osteoporosis is the most common bone disease and is caused by the thinning of the bones. Referred to as a “silent disease,” osteoporosis may go undetected until a senior factures a bone. Osteoporosis may be prevented by regular intake of calcium and Vitamin D, so caregivers should create a daily task in their homecare software or homecare system for reminding their senior clients to take these bone-strengthening supplements. Paget’s Disease, the second most common bone disease of the elderly, affects the formation of bones in the body. Patients with Paget’s disease experience an excessive amount of bone removal, followed by more excessive bone formation which results in larger bones being formed. These new bones may be soft or deformed, which can result in pain and fracture. While surgery is recommended for some, others can manage their disease with anti-inflammatory drugs. Caregivers can use ClearCare Online’s homecare system for secure medication management. 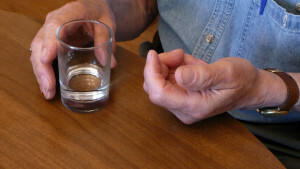 Rheumatoid arthritis and Osteoarthritis are two other common conditions found in the elderly. Osteoarthritis occurs when cartilage at the ends of the bones wears down and restricts the bones movement. Rheumatoid arthritis is caused by inflammation of the joints and similar to Osteoarthritis, can be very painful. Researchers estimate that the majority of seniors over the age of 75 have osteoarthritis in at least one joint so taking precautionary measures to avoid bone disease is very important. Seniors who are at risk for bone disease – if it runs in their family for example – should be especially diligent about making sure they are doing all they can to keep their bones strong and healthy. Along with Vitamin D and calcium supplements, a regular exercise routine will help seniors maintain healthy bones. Caregivers can set daily reminders for exercise using ClearCare Online’s homecare software and homecare system, as well as note any concerns or issues the senior is experiencing after his workout. Although bone diseases are quite common in the elderly, proper treatment can relieve painful symptoms and help keep seniors active and independent. For more details on how ClearCare Online’ s homecare software can help, call 1-800-449-0465.